Have you been considering remodeling your kitchen or bathroom? If not, it may be the time to do so, as 53% of homeowners agree that now is a good time to renovate your home. It is estimated that in 2014, 60% of homeowners are prepared to spend more on their home remodeling process than those who made improvements in the last year. So if you’ve been thinking it may be time for some remodeling, here are some remodeling ideas for your home renovation projects that are taking homeowners by storm this year. Based on a survey about home renovation by the National Association of Home Builders, bathroom remodeling accounts for 78% of requested home renovations in the United States. Homeowners now desire larger showering areas with more sophisticated technology, such as steam showers or larger, rainwater shower heads. Other trends include seating in the shower, or more shelving to place their toiletries within easy reach. When it comes to tiling, glass tiles can add a touch of sophistication to your bathroom. 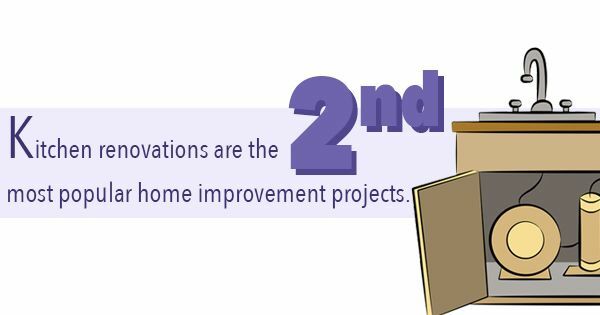 Kitchen renovations are the second most popular home renovations, as 69% of homeowners surveyed have already remodeled their kitchen, or plan to soon. One of the most popular kitchen remodeling ideas is the handle-less trend, a technology that has been included in modern faucets, trash bins, and even cabinet doors. The addition of a breakfast bar or island can open up your kitchen and will help bring the whole family together for during mealtime. Home design and renovation can not only improve your lifestyle but also raise the value of your home. Home with new bathrooms or kitchens is resold more quickly, as even minor bathroom or kitchen remodeling can improve your home’s value and earn you a return of 63.6% or 73% on average, respectively. Using these remodeling ideas, you can keep your house in top shape, while also simplifying your home life and making your bathroom or kitchen the envy of your neighbors.